I was thinking that once you are here in Fair Play and are enjoying some of the great wines from the many great wineries here, you'd wonder how it all started. 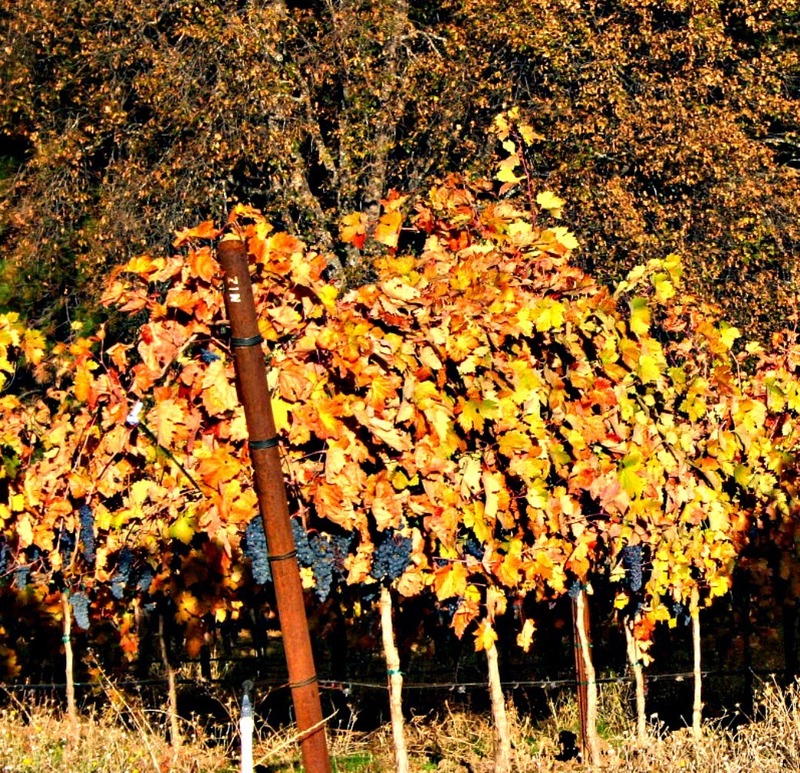 This is the second part of the History of the Fair Play Wine Country. 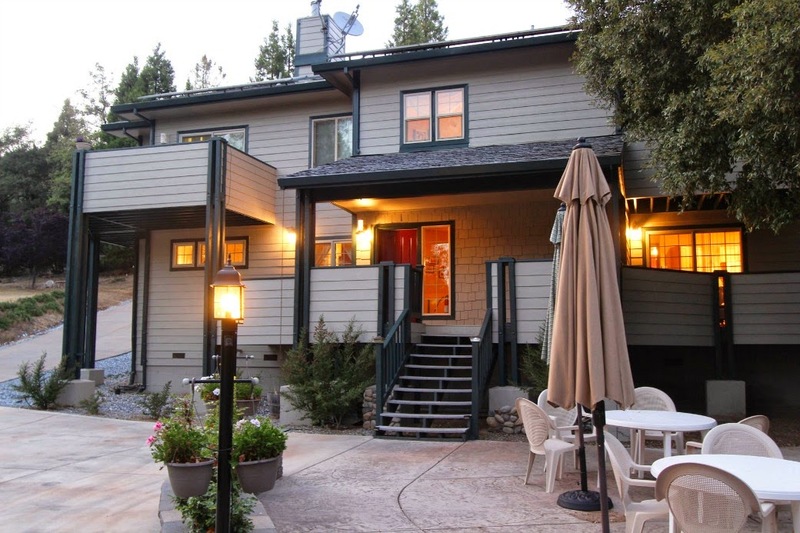 Lucinda's Country Inn is as much a part of the history of the Fair Play Wine Country as many of the newer wineries. Lucinda's Country Inn lower entrance. Lucinda (Cindy) & I bought the property in 1997. We quickly began to redirect the drainage. You never really control the water runoff, but you can help it flow into places you want it to go. We installed a 12" by 450' long culvert on the east side of our building site. On the west there is an 18" by 500 foot long one. That helped keep the vast majority of water from running directly through our building site. We then were able to build Lucinda's Country Inn, with the help a a large 600 foot long french drain on the Perry Creek Rd. side of the building site.. I mention Lucinda's Country Inn before any of the wineries because the first four wineries were the only ones really in Fair Play before Cindy & I became a small part of Fair Play. Well, I guess that's not exactly, completely true. 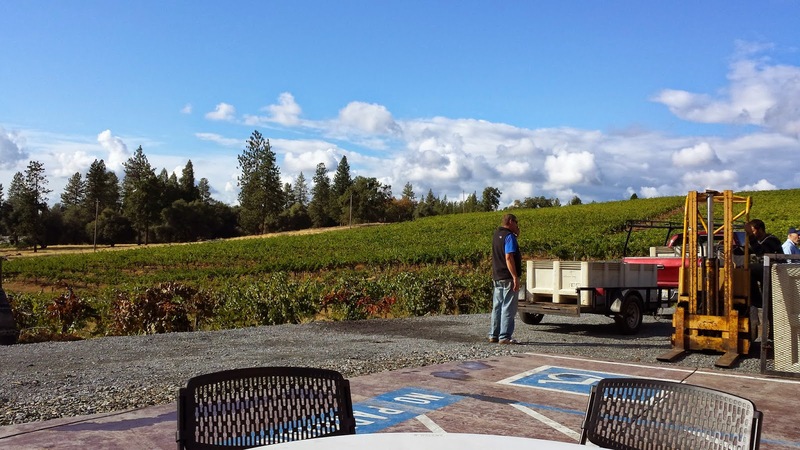 Perry Creek Vineyards & Winery and Single Leaf Winery were in their infancy, a little while before we opened Lucinda's Country Inn. Perry Creek was started by a gentleman from Southern California who made his money in the textile business. Michael Chasen built his winery, planted his grapes and became known for his auto collection and the walk-in cigar humidor. He later bought 7UP Bar Ranch and converted it into a B&B and added more vines on that property. Cindy & I stayed many a night at 7UP Bar Ranch B&B while we looked for our property and started our work on Lucinda's. Single Leaf Winery was started by Scott & Pam Miller, who at the time lived in Carson City, NV. Scott was the curator for the Nevada State Museum while Pam toiled as a lobbyist for the Nevada Contractors. 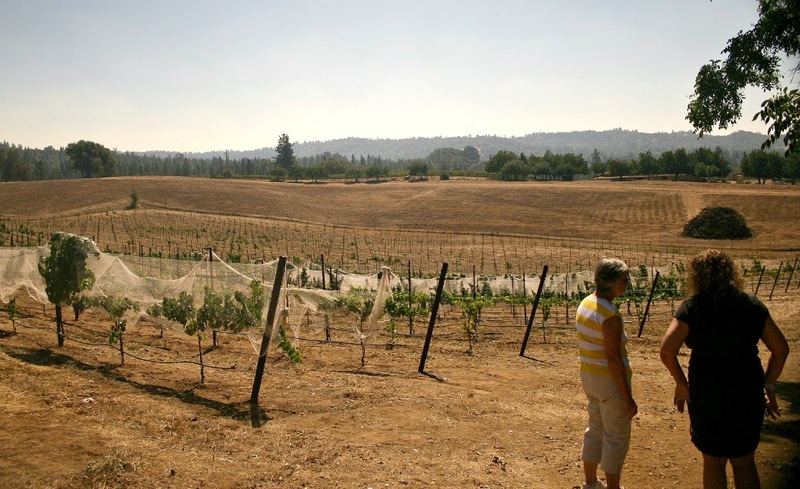 They traveled over the hill for decades planting their vines and tending to the efforts of starting their winery. They live in a 5th Wheel while doing all this. Finally, after opening their tasting room they got their home built. Today this is the view from Single Leaf's deck over looking their vineyard and the Fair Play Valley. A quick digression: Cindy & I frequented Fair Play from Southern California when we lived there for a few years. On one trip we saw a sign on the road "Winery OPEN". The driveway went up the long hill to a little red building, not much bigger than a small farm barn. There was a concrete pad on the side of the "barn" so we knew it wasn't a farm operation. We heard a man's voice yelling "I'll be right there." It was Scott yelling from his tractor down hill in the vineyard. About five minutes later he was walking up beating dirt from his clothes as he approached. We were the first official wine tasters for Single Leaf Winery. So when we started the detailed plans for Lucinda's Country Inn there were just 6 wineries in Fair Play. We designed Lucinda's based on the fact of no restaurants and few wineries in Fair Play. Before we started building two more wineries were added. Oakstone Winery and Chalet Fleur de Lys were up and running. Oakstone Winery up from the ashes as Oakstone2.0 ! John and Susan Smith were the founders of Oakstone Winery. They opened their tasting rooms doors in 1997. In John's prior life he was a chemist with Johnson & Johnson's Life Scan Division. Susan was a teacher in a community college in the Bay Area, where they moved from. John worked with Scot Miller at Single Leaf for a time. Neither will admit who was teaching who the wine making skills, but both do admit they'd be worse off without the other's help. One fine summer night about four years ago a fire started in the Oakstone barrel room. When the forklift's propane fuel tank got hot enough it exploded and blew Oakstone Winery to smithereens. The fire burned everything but one portion of one wall. Everything was lost. Fortunately, a few years earlier John had started another small winery, just for him to have fun making obscure wines, hence the name Obscurity Cellars. So Oakstone 2.0 was born out of the ashes of Oakstone and in the facilities of Obscurity Cellars. Steve & Liz Ryan make an excellent team and have preserved the integrity of Oakstone and are championing great strides to keep the traditions of Oakstone alive and growing. Chalet Fleur de Lys was born from the labor of love of the outdoors and growing things. 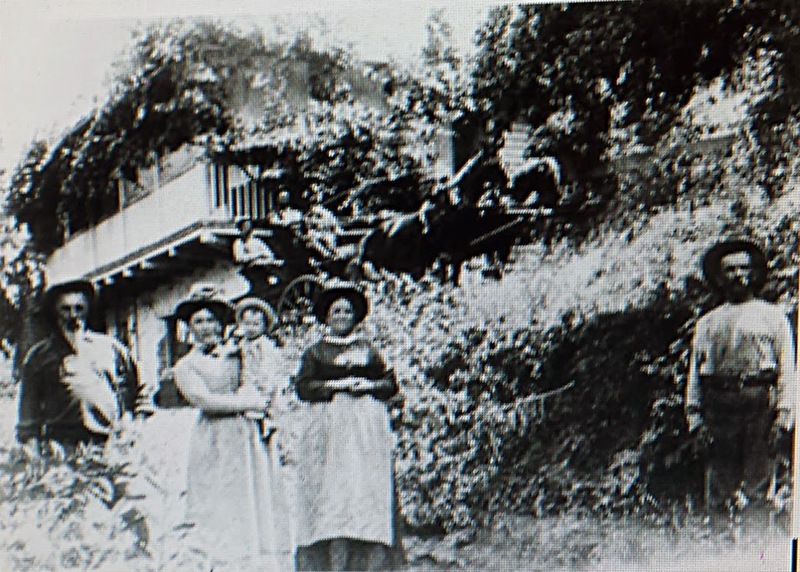 Robert Lajoie was in the printing business for many years when he and his wife, Mireille, discovered El Dorado County on a trip to Coloma to pan for gold. Their migration began in Montreal then to Burbank and they finally moved to Fair Play and started their vineyard venture in 1996. The Gilpin family of Windwalker helped Robert with the beginnings of their operation. In fact, Robert used to work in the Windwalker tasting room with Arnie. Both fed off each to tell outrageous stories and have lots of fun. They became "grasshoppers", everlasting friends. Cindy & I would stop in at Windwalker and Arnie would have us take their grasshopper to Robert's, and vise a virsa. The Fleur de Lys tasting room opened as Lucinda's Country Inn was going through the torture of the County permitting process. Cindy & I would venture to Robert & Meri's on Sunday afternoons late and lament about the rigors we went through the past week and shared stories about them & us going through the BS (Business Stuff) of the County. There we few visitors in the tasting room in those early days, so Robert and I would get animated to the hilt. Cindy & I lived next door to a future winery for two years while getting started on the construction of Lucinda's Country Inn. That winery became a newbies then. I'll explain in part 3. I was thinking; what would it be like to stay in other places close to home. Saturday, July 26th, we had the unfortunate opportunity to do just that because the Sand Fire forced us to evacuate Lucinda's Country Inn and send all our guests away to safety.That was a nerve wracking experience. For 2-1/2 days we were on pins and needles awaiting official word about the Sand Fire and its advancement towards Fair Play. Yes, we got tid bits and snippets of information over the TV and radio. The officials in charge were dedicated to getting the Sand Fire under complete control. We finally started to get some real details via the Cal Fire website on Sunday night and Monday morning. We returned to a standing Lucinda's Country Inn on Tuesday, July 29th; just as a precaution we stayed that extra night. The fire was being somewhat controlled until Saturday afternoon when the winds blew it out of control. So we knew it had a potential to do it again because Monday afternoon it was windy. We returned to see her exactly as we left her. Saturday about 6:30pm we got the word the evacuation is for real. By the time we grabbed our photos and a few picture/paintings on the walls that are extremely sentimental, complete tree leaves blacken by the fire and chunks of wood the size of large marbles had fallen all over the property. We knew it was time to get us, our son and grandson the hell out of Fair Play. We thought most folks who evacuated on Friday and earlier than us were taking every room available in the Placerville hotels and motels. I drove up to Pollock Pines to find the two hotels there had NO Vacancies!! Driving further up Highway 50 toward Lake Tahoe, about 25 miles our side of Lake Tahoe, we found Strawberry Lodge. Cindy & I spent one night there a few years ago when we did a ride in the Highway 50 60th Wagon Train. We only slept in the room, there was an evening BBQ with dance and a Chuck Wagon breakfast. We did not have the pleasure of a dining experience. When we got the last 2 rooms that Saturday I believe the only modernizing Strawberry Lodge ever experienced was adding electricity and plumbing. The rooms were small and the beds, linens and table and chair were from the Great Depression Era. Bad by any standard. The dining room service in the morning was by folks playing Keystone Cops, or chickens with theirs heads cut off. Cindy got our waters and coffees. It was probably the best example of how NOT to run a dining room. Sunday & Monday nights were a sheer delight. After trying a couple other lodging establishments; both mostly filled with Cal Fire personnel, we were lucky to get the last 2 rooms at the Holiday Inn Express at El Dorado Hills. They upgraded us to their Romantic Suite and another suite. The management worked with many locals who were displaced because of the Sand Fire. Every single employee treated us like royalty. Jenny, the General Manager, even called some of the corporate clientele to ask them to wait a week before returning, so she could have room for the Sand Fire evacuees.Thank you to all Holiday Inn Express employees for your kindness and professionalism. I write this blog to say I've found a new retreat for Cindy & I. And, it's even closer than Lake Tahoe. The Holiday Inn Express at El Dorado Hills is our new home away from home. So to answer my thought at the beginning, yes there is a great place to stay close to Fair Play. I encourage you too to stay at the Holiday Inn Express and tell 'em Daryl & Cindy of Lucinda's Country Inn sent you. I was thinking that once you are here in Fair Play and are enjoying some of the great wines from the many great wineries here, you'd wonder how it all started. Well, I'll give you some history, at least as I know it. I think I'm pretty sure of most of the details since Cindy and I have been traveling up to the Fair Play area for over four decades and long before there was any wineries. We ran the car rallies of the late sixties and early seventies. (For those who don't remember or know about car rallies, let me explain. A car rally is either a gimmick rally or T&D - time & distance. You follow directions along country roads & byways to check points and eventually get to the finish. Either you do it to be timed and get the closest mileage that the rally master designed or you read the pages of instructions and follow the fun twists and turns in the instructions; to get to the finish line. It was usually a pizza parlor or a bar.) Up here in this part of El Dorado County the roads twist and turn and all the roads connect into another one that connects into one that connects back to the road you started from. So you really can't get TOO lost for TOO long, as long as you keep moving. A vine I've named Bountiful with its new grapes. Now that you understand how we know what was in Fair Play before any wineries, I can now tell you about the vineyards and wineries. I believe it was about 1967 the UC Davis Agricultural Extension Program was studying some of the places and elevations where grapes would flourish. Vernon Gerwer owned property in Fair Play. He was a County Supervisor for many years and UC Davis contacted him about their study. They worked together to plant a few acres of grapes. A few years later there were rich, sugar concentrated grapes that matured. The next question was, were those grapes viable for making wine. The viticulture & enology department at the campus made some very good wine. Ala, wine is possible in Fair Play. 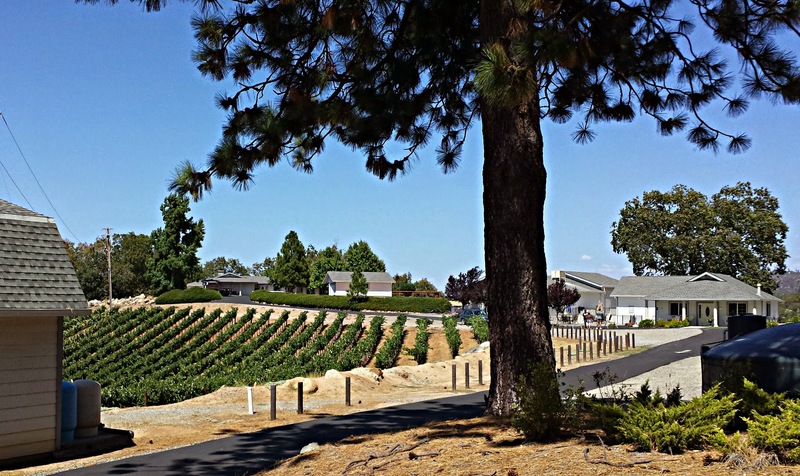 Vernon Gerwer started Gerwer Winery, Les Russel started Granite Springs Winery and Brian Fitzpatrick started Fitzpatrick Winery & Lodge; they were the first three wineries in Fair Play. Of course it took a few years for the grapes to mature before making wine. They all opened for business about the same time in the early 1980's. That inspired other people to forge their own vineyards and start wineries. L.W. Richards quickly followed suit with his LW Richards Winery. He sold to the Bailey family shortly after his successful venture started. The Bailey's changed the name to Windwalker Vineyards & Winery in honor of one of their horses. In the mid '90s Arnie & Paige Gilpin bought Windwalker for their winemaker son, Rich. Now Windwalker is owned by Jim & Alanna Taff. Windwalker was awarded the Golden Bear for the BEST RED OF SHOW at the California State Fair in 2011 for their 2008 Primitivo. That was the first for any Fair Play wineries. Owners of the earliest wineries also sold. Gerwer sold to Charles B. Mitchell who changed the name to Charles B. Mitchell Vineyards. Les Russel sold to Frank Latchman, owner/founder of Latcham Winery, who kept the name Granite Springs. Since Frank passed a few years ago the Latcham family has sold Granite Springs to Chris Barnham. 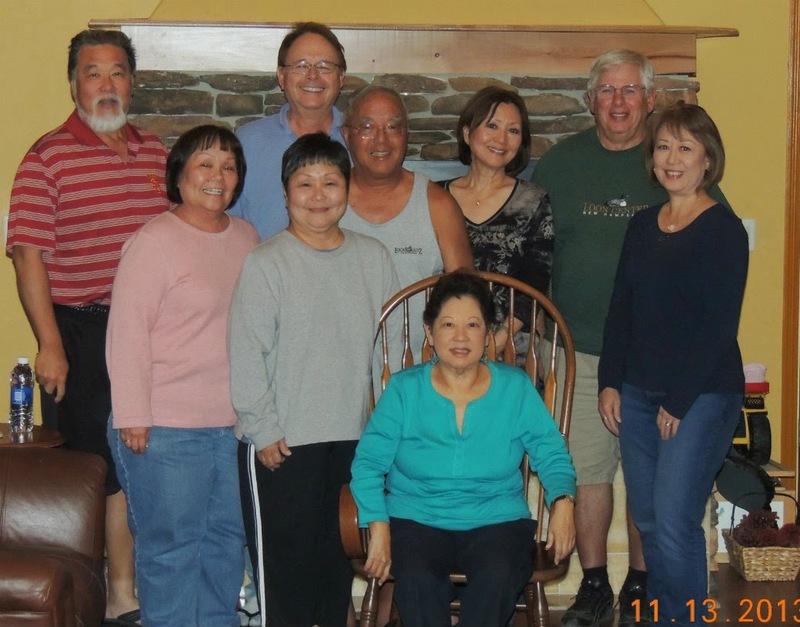 After 30+ years Brian & Diana Fitzpatrick sold Fitzpatrick Winery and Lodge to Vivan Li. She has changed the name to Gold Mountain Winery and Fitzpatrick Lodge. in September '13. The Langman Family Winery. Oh, yeah. I almost forgot to tell you. Over the years during this evolution of Fair Play Cindy & I have been to every one of these wineries and all the newer ones I'll write about next time.